Yes you need to buy a home to create an asset for your family in a location like Southern Indiana, Louisville, KY. Yes it is now easier than ever to make a move in this direction with low mortgage rates and more than ready lenders to help you financially. Buying a home is the biggest financial decision of your life. It is very hard to be fully prepared at the time of buying. But there are many important things you need to know before buying a home. There is no need to worry if you have a decent credit score but the first thing you need to do is to try and fix your credit score if it is below the qualifying mark. Most lenders look at the credit history of the applicant to arrive at a decision regarding disbursing mortgage loan. Invest some time to rectify the score if you think your application can be rejected by the lenders. If you are living in a rented house in Southern Indiana, Louisville, KY with your spouse and kids, you must have thought about buying a home. It is a thought that crosses the minds of all men and women who have more or less settled into their careers and earning a steady income every month. Easy availability of fund from banks at low interest rates has allowed many individuals to buy homes by paying in monthly installments. You can never have a property in your name if you continue to live in rented homes. In fact, it is the prospect of owning a home in the same amount being paid as rent that is very alluring for the homebuyers. You can think of buying a $300,000 home in Southern Indiana, Louisville, KY with just a fraction of this amount in your bank account. Even this small payment is asked by lenders from the borrowers to make sure they have a stake in the property and remain committed to their repayment obligations. You pay the rest of the amount in easy monthly installments that are more or less equal to your rent. You get to live in your new home and the mortgage arrangement allows you to create a hard asset in your name. There are hundreds of economic activities and real estate is just one of them. But it is nothing like any of the other activities in the sense that it is perennial in nature and serves a mode of investment. Like all other businesses, real estate has changed dramatically in the last few decades and it has become technology savvy and also easier for common people. But no one is sure as to what will be the shape and nature of real estate in the future. What is the reason for selling the property? There is always a reason for something, whether it be purchase or sale, therefore when it comes to selling or buying the property, the buyer should analyze the reason of sale. In many instances, an owner is selling in order to purchase another property. Other instances may include, the property owner passing away, changing demographics of a neighborhood, legal problems or a life-style change for the owner. Knowing the reason for the sale of the property could help the buyer during negotiations. Listing time tells a lot about the property. For instance, if the property has been listed for more than 6 months, there may be some obvious reasons (priced too high, poor condition, undesirable location or lack of marketing exposure). However, if the property has not been listed very long you may feel more interested in the property because it is considered golden. Are there any disputes involved? It is the dream of every young man and woman to buy a home in his/her own name. Buying a home in one of the best real estate markets in the U.S. i.e. Southern Indiana, Louisville helps to generate wealth and also proves to be the best investment for the future. By buying a home, you not only arrange a great place for the family to live but also create a hard asset. Buying your dream home is a major financial decision. Here are 4 important tips to help make buying your dream home easier. This is the golden tip for all first time home buyers when they have saved money in their bank accounts for a down payment. No need to rush to buy the first home you see. Buy a home that you can afford rather than buying a house with features that are redundant. Is a $45,000 Thanksgiving Dinner Worth It? It’s that time of year again when friends and family plan a massive feast they enjoy over laughter, memories and the occasional burp that disrupts the silence. Some people prefer to have Thanksgiving dinner in the comfort of their own homes while others opt for going out and eating dinner at a nice restaurant. If you’re in New York, you and eight of your friends can head over to the Old Homestead Steakhouse in the Meatpacking District and shell out $45,000 for the most expensive Thanksgiving Day dinner in history. And what does a $45,000 Thanksgiving Dinner look like? It looks pretty much like you would expect. It’s got a turkey, stuffing and sourdough bread. Seems pretty simple right? Well, unlike the feast you prepare with your family, this one has some pretty outrageous features and is intended as an “engagement dinner” to propose to a loved one. The feast that costs more than the median annual salary in the U.S. includes two 20-pound turkeys, champagne (your choice of Cristal or Dom Perignon), Royal Ostera Beluga caviar and stuffing made with imported Wagyu beef. Oh, and each meal comes with a two-karat emerald cut diamond engagement ring –hidden in the stuffing. And then just go over the top with it all. But is a $45,000 Thanksgiving Dinner ever worth it? Louisville and the Kentuckiana area have a lot to offer in the way of food, but sometimes you just want a good old fashioned burger. 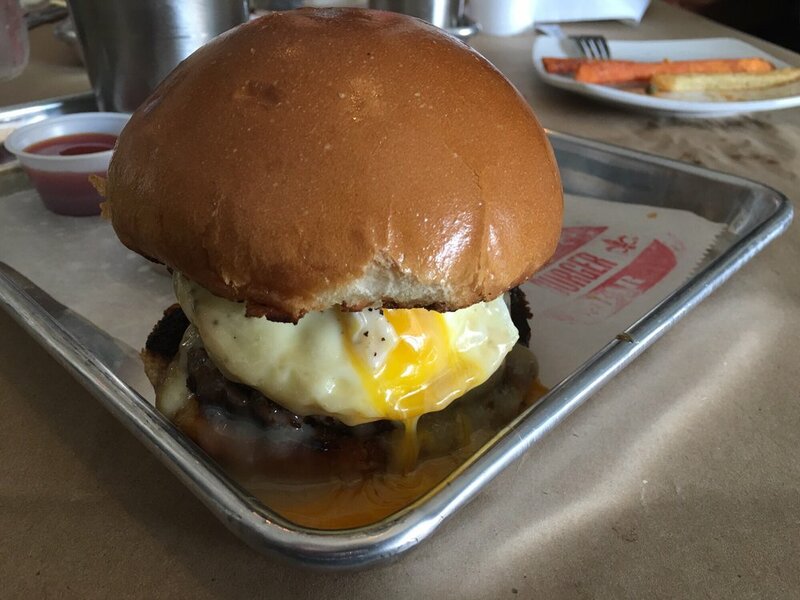 If you’re looking to find a great burger in Louisville, the journey won’t take too long. Louisville’s own Courier Journal and thrillest.com recently published what they believe to be the best burgers in Louisville and we’ll point out a few of our favorites. We’ve selected our three favorite locations to help you get your hands on the best burger in Louisville. Big Four Burgers + Beer is the only Indiana restaurant on the list and has certainly earned its place. Big Four Burgers + Beer is located in downtown Jeffersonville and offers an outside deck area that is great to enjoy lunch on a Sunday afternoon. One of the burgers that stands out is the Big Blue, which is made with ground chuck, bleu cheese, bacon, red onion, lettuce, tomato, spicy pickles and garlic aioli. Big Four also offers amazing crispy sweet potato fries and homemade milkshakes. Louisville Kentucky is more than just home to the Kentucky Derby and the Louisville Slugger baseball bats. Louisville has become a great place live, work and raise a family. There are more than enough activities to entertain a young family or keep a retired couple having fun. That’s why it’s no surprise Louisville is beginning to make headlines as a great place to live, a great place to work and a great place to buy a home. Realtor.com recently released a countrywide analysis and the Louisville 40205 zip code, which includes neighborhoods like the Highlands and Seneca Gardens, came in the top 25. Memorial Day Weekend is coming up, and there is lots to do in Kentuckiana to celebrate! What’s the best part? These events are inexpensive and family-friendly!